Winco BS-15 Bar Shaker, 15 oz. 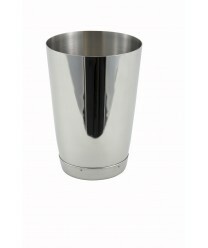 Constructed from durable stainless steel, the Winco BS-15 Bar Shaker, 15 oz. does a superb job mixing up great-tasting chilled cocktails. These high-quality easy-to-wash shaker cups have a 15-ounce capacity and a mirrored exterior. Winco BS-30 Stainless Steel Bar Shaker, 30 oz.